L'Embrouchure holiday camping site is perfectly located next to the Mediterranean sea along the coast of lovely Languedoc. L'Embrouchure holiday camping site is perfectly located next to the Mediterranean sea along the coast of lovely Languedoc. With its exceptional pool complex and immediate access to a stretch of golden sand, this seaside resort is the one-stop-shop for holidaying families. To find out availability on mobile home accommodations, get in touch with LUX-camp today and we'll get your dream holiday under way. Welcome to L'Embrouchure Luxury Camping Site. What's Unique About L'Embrouchure Luxury Camping? Twin aspect of pool complex and direct access to beach. Free access to the campsite "Le Floride" located next door. Relaxing fitness and wellness centre. The family have four pools to choose from at L'Embrouchure camping holiday. There's two heated pools, one covered pool, and one paddling pond for the younger ones to splash about in. The pools have some nice extras like a hot tub, counter-current pool feature and lots of water slides of course. If that isn't enough water frolics, the family only have to walk 400 m to land on the shores of the magnificent Mediterranean ocean. L'Embrouchure offers mobile home accommodations and you'll be hard pressed to leave that luxury, but there's an onsite fitness and wellness centre for adults who fancy a bit of extra pampering. You can choose from a variety of treatments like depilation, massage, facials and full body treatments. There's even an onsite beautician who can do make-up and other facial treats. 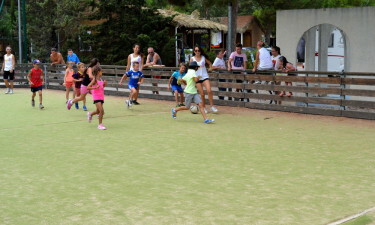 L'Embrouchure camping resort has lots of physical activities for you to enjoy like the multi-sports ground, a weight lifting room, basketball, volleyball and football. 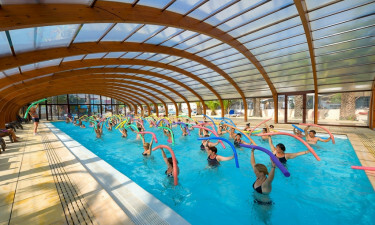 For those who wish to keep in shape there's the aquagym, and fitness/stretching sessions all organized onsite. There's also video games, Pétanque, table tennis, billiards and a TV room. In the evening you can dance your legs off at the organized disco's and the kids and teens clubs provide even more activities. Gas BBQs are authorized at this site if you fancy dining beneath the stars. There's also a resident restaurant, which provides an interesting menu of local delicacies as well the international fare. You can dine indoors or on the terrace as seating is available in both areas. 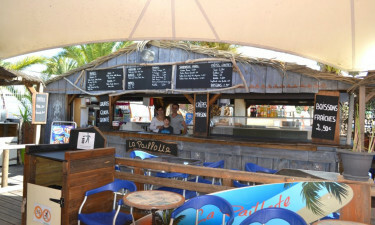 There'a a lovely little snack bar, pizzeria, take-away service and a lively bar where you can enjoy a glass of local French wine. L'Embrouchure campsite has a lovely mini-market that stocks all those regular grocery items to make your camping holiday easy and enjoyable. There's also a fresh bread delivery service. You'll be sure to want to take something unique home from this popular holiday resort that will always remind you of your holiday so why not pop into the onsite Souvenir shop/bazar.